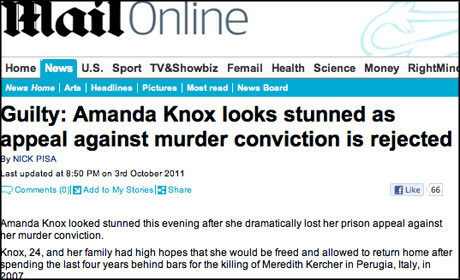 The Press Complaints Commission has upheld a complaint against the Mail Online for an "inaccurate and misleading" article which incorrectly reported that Amanda Knox's conviction had been upheld and included descriptions of events "which had not taken place". The PCC said it received "a number of complaints" that the October article breached Clause 1 of the Editors' Code of Practice, which governs accuracy. The article, which was live for 90 seconds, reported a guilty verdict for Knox and her former boyfriend Raffaele Sollecito as well as describing the apparent reaction of family in the court room and prosecutors upon hearing the verdict. The PCC said the Daily Mail had apologised but the newspaper also said it "was standard practice in such high-profile cases for two alternative stories (plus supporting quotes) to be prepared in advance, and cited the fact that other news outlets had also initially published the wrong verdict due to some confusion in the courtroom". This included the Sun and Sky News, which initially reported a guilty verdict as well as the Guardian which initially reported that Knox's appeal was rejected in its liveblog. The Daily Mail added that it had gone on to publish "an online apology and explanation to readers; published the correct verdict in print the following day; launched an immediate internal inquiry (and subsequently changed its practices regarding such 'set and hold' stories); and disciplined the person responsible for the error". But the PCC said while this action had been taken "swiftly and proportionately" there was still concerns about the inclusion of "the account of what had apparently happened in the courtroom". "The attempt to present contemporaneous reporting of events in such a manner was 'clearly not acceptable'", the PCC concluded. "This was a common-sense decision from the commission,' Stephen Abell, director of the PCC, added. "The article described reactions and behaviour that had not taken place, which is a clear breach of the Code. We are pleased that Mail Online has undertaken to change its processes as a result, which should stop this happening in future".